I recently sat down with my dear friend Shelly Yakus to talk about his experience recording one of the most iconic guitar riffs of all time! Shelly has had a phenomenal career. Not only is he a renowned producer and recording/mixing engineer, but he’s also heavily involved with modern recording tech as co-founder/chief engineer of AfterMaster Audio Labs. Shelly is considered by his peers to be an absolute audio expert and one of the best engineers/mixers/studio designers in the industry. Needless to say, he’s a living legend! Of course, he’s also recorded and mixed many of the world’s top artists. John Lennon, Stevie Nicks, Alice Cooper, Van Morrison, Tom Petty, Dire Straits, Bob Seger, Amy Grant, Don Henley, U2, and Madonna are but a few of his many credits. 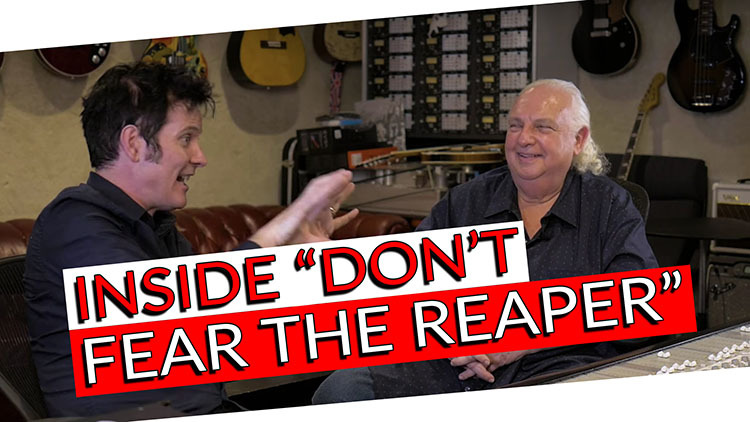 This time around, we had a chance to talk about his time recording the Blue Oyster Cult classic, “(Don’t Fear) The Reaper.” Who better to talk about such a prominent song with than the man who was there to engineer it: Shelly Yakus! We were fortunate to be able to get a lot of insight into the whole process, including the “Shelly Yakus Special” snare sound and how the incredibly articulate picking on the main guitar riff was done. We talked lots of “insider” secrets here while breaking down the song into its isolated elements! Many of us probably remember the hilarious Saturday Night Live skit which parodied “(Don’t Fear) The Reaper’s” recording process. The sketch was a tribute to the song, with actors Will Ferrell and Christopher Walken playing fictionalized band member and producer. Buck Dharma of Blue Oyster Cult himself has stated he thought the April 2000 sketch was fantastic, even if it took away from some of the “creepiness” the song was originally going for. “(Don’t Fear) The Reaper” was recorded in Studio B at the Record Plant in New York. The sounds Shelly achieved on the song were influenced by the atmosphere in Studio B. There was a shag rug, padded walls, and an overall very dry sound because of all the absorption. For the guitars specifically, Shelly used a sensitive tube mic to capture the room and add in some ambience that a less sensitive microphone wouldn’t have picked up. He also printed a bit of delay right onto the track to add in some “room tone” that was lacking in such a dry space. Shelly used Record Plant’s DataMix console which resembled an upright piano. It wasn’t ideal at first glance, but it was able to translate the way a band really sounded quite well. Unusual for the period, the song was recorded and mixed on the same console! Shelly believes that if the song were recorded in a different room, he wouldn’t have worked as hard to get the amazing results he did. “(Don’t Fear) The Reaper” was Blue Oyster Cult’s highest-charting song in the US. The track was on the Billboard Hot 100 20 weeks, peaking at number 12 for the weeks between November 6 and November 13 1976. It was the band’s highest-charting song in the States, ultimately helping the album Agents of Fortune hit number 29 on the Billboard 200. “(Don’t Fear) The Reaper” was also successful in Canada, peaking at number 7. The iconic tune was also Rolling Stone‘s song of the year in 1976 and has been featured in “Top 500” songs list since.